If you have an existing LifeSize room system in place, you can integrate its native calendaring system using the Zoom Conference Room Connector. This lets you start a scheduled Zoom meeting directly from the existing hardware. You can also start an instant meeting using a configured Zoom Meeting ID, or join the room into a meeting that is not on the calendar. Software version 2.8 or higher- Learn more about supported devices and firmware . From the API Connector Server to the LifeSize endpoint. Login to the Zoom web portal and navigate to Cisco/Polycom Rooms. Note: if you do not already have a Cloud Room Connector license, this page provides instructions on how to purchase it. Click the API Connectors tab and click Add API Connector. Enter the network information in the popup dialog. By default, the range covers all possible networks that your system might be using. You can limit this to the actual network and subnet information used with your LifeSize system. Note: If you need to use multiple connectors, make sure that the network values that you specify for each connector do not overlap. The new connector, with an automatically generated Connector ID, displays in the list of API Connectors. The Connector ID, which is copied to your clipboard when it is generated, will be used in the procedure to install the Zoom API Connector software. 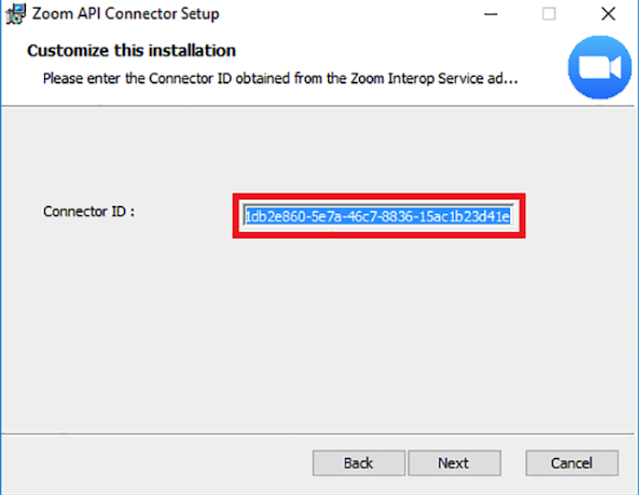 The Zoom API Connector installer opens a wizard, where you enter the Connector ID (created in the previous procedure) associated with the Zoom cloud. Note that the API Connector software runs on a Windows Server or Virtual Machine. From your Google Chrome browser, sign into Zoom, and click Cisco/Polycom Rooms. Click the API Connectors tab, then click the Install action for the connector. This downloads the installer for the Zoom API Connector ready for installation and copies the Connector ID to the local clipboard for your convenience. If the ZoomAPIConnector.msi file was downloaded using a different computer than the one you’re installing on, move the file to the installation computer. Double-click ZoomAPIConnector.msi to open the wizard and begin the installation process. Use the wizard pages to accept the license agreement and specify an installation location, then click Next. Enter the Connector ID in the Customize this installation page of the wizard. This is the value that was automatically generated in the procedure to associate the Zoom Connector to the network. Click Next, then click Install to complete the installation of the Zoom API Connector software. After the installation is complete, click Finish to exit the wizard. The Zoom API Connector is now associated with the network that includes the LifeSize room system. The Zoom API Connector service only needs to be installed one time, regardless of how many LifeSize room systems you need to configure. Note: You must keep the Zoom API Configuration software running on a Windows Server or a Virtual Machine that is always available and connected to the internet. 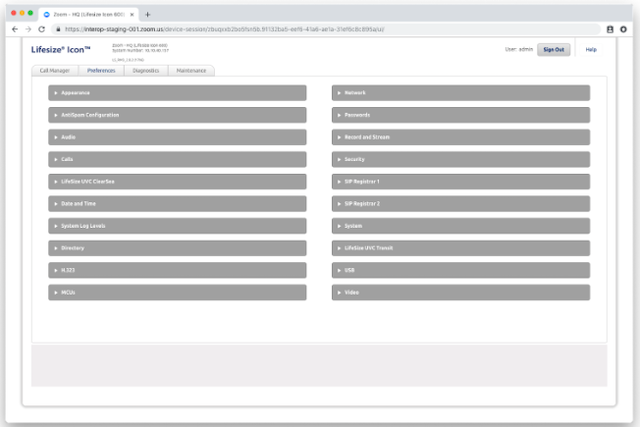 Use the Room Connector API to populate the provisioning settings for the LifeSize room system and connect it with a calendar that is accessible to the Zoom cloud. Click the Rooms tab, and then click Add Room. Room Name - Enter the name that will be displayed on the Rooms tab of the Calendar Integration page. Note that the name of the Edit dialog changes as you type in this field. Serial Number - Enter the serial number for the system. Device Username - Enter the username if your device does not use the default value of admin. IP Address - Enter the IP address displayed on the TV screen when the LifeSize system is ready for integration with Zoom. Calendars - Enter at least one calendar address (either Exchange, Office 365, or Google) of the room where the LifeSize system is located. Note: This is typically the room resource email address. Registration Password - The Registration Password authenticates the automatically generated Registration Username. Enter a custom password with a minimum of 6 characters, or leave this field blank to automatically generate a strong password. Time Zone - Choose the correct time zone for this device’s location using the drop down dialog box. Alternative Time Server - Specify the value of a local time server if you need to override the default time server. SIP Call Control - Choose the correct SIP line configuration for this device. This setting will be based on the environment and the call control platform it is utilizing. The default is Enabled, not registered. H.323 Gatekeeper - Choose the correct H.323 gatekeeper settings based on the endpoint’s configuration and environment. The default is Disabled. The values that you entered are used to provision the LifeSize system with services and settings, including calendaring, SIP or H.323 service, and other system settings optimized for use with Zoom meetings. Click the Calendar Credentials tab. Note that it might take several seconds before the values saved in the Rooms tab populate. Click Allow in the dialog that shows the actions that Zoom will use for calendar management. Click Edit to open the room settings. Choose the Type (either ews for Exchange or O365 for Outlook). Enter the Username and Password for the account. Choose the proper Impersonation setting by leaving Delegate enabled or switching to Impersonation. 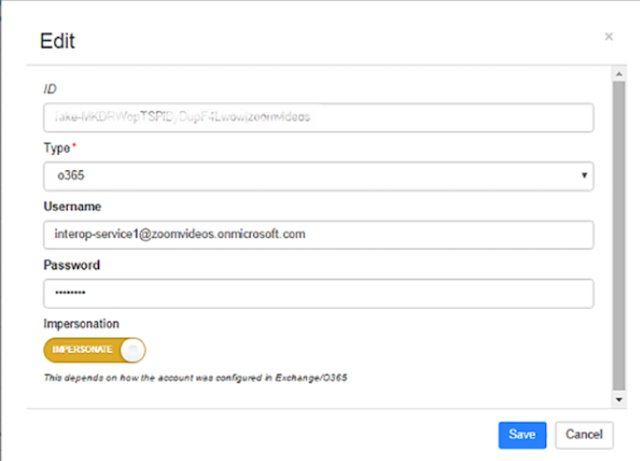 This setting depends on how this service account is configured on Exchange please see this Microsoft article for additional clarification. After calendar access has been approved, the LifeSize system is provisioned for Zoom meetings that are on the associated calendar. Any Zoom meetings that you start or join from your LifeSize room system display on the TV screen, using the integrated camera for video, and the integrated speakers and microphones for audio during the meeting. Hide Topic Toggle this option to Hide if you want to prevent the meeting topic from being displayed on the LifeSize screen. If you leave this toggled to Default, the meeting topic from the calendar displays, if it is available. Hide Agenda Toggle this option to Hide if you want to prevent the meeting description from being displayed on the LifeSize screen. If you leave this toggled to Default, the meeting description from the calendar displays, if it is available. Default Topic The topic that displays on your LifeSize screen for meetings in the room’s calendar that are not Zoom meetings, if the meeting topic is not available in the calendar. If you do not change this value, the topic that displays is Reserved. Default Topic (Zoom) The topic that displays on your LifeSize screen for a Zoom meeting if the meeting topic is not available in the calendar. If you do not change this value, the topic that displays is Zoom Meeting. Use the actions on the Rooms tab to Edit or Delete configuration settings. Note: Deleting the endpoint is not recommended unless a full de-provisioning procedure is followed. The easiest way to de-provision the endpoint is a factory reset. Hover over the Active or Error status of your room to reveal a menu of options and status. Choose Admin UI to display the administrator console for the room. Choose Available or In Meeting to see a list of the calendar events in the calendar. Hover your mouse cursor over any status to get more details for that status.